B4R is now based on the latest version of the IDE. It includes auto backups, bookmarks improvements, warning improvements and bug fixes. The list of boards is now sorted in the boards manager. Note that ESP8266 SDK v2.4.2 is still required when targeting ESP8266 boards. 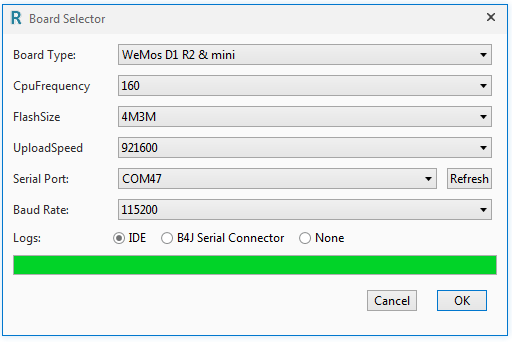 SD.Remove / Exist supported by ESP8266. Compilation and deployments logs are printed in the IDE logs. #DefineExtra attribute - Allows to add custom define commands to the main defines file. ESP8266WiFi.Connect - Timeouts after 15 seconds if there is no connection. IDE improvements - Refactoring, replace from quick search and others. The ESP32 SDK is more mature. Communication works perfectly. Support for Arduino IDE 1.8.0 (https://www.arduino.cc/en/Main/Software). Auto-formatting feature as in the other B4X IDEs. WiFiSSLSocket (ESP8266) - Similar to WiFiSocket for SSL connections. AsyncStream.MaxBufferSize field. Allows changing the size limit of the internal buffer. Note that #StackBufferSize must be large enough to hold the data. The default value is 100. Humberto, Javier Lovay and Cableguy like this.